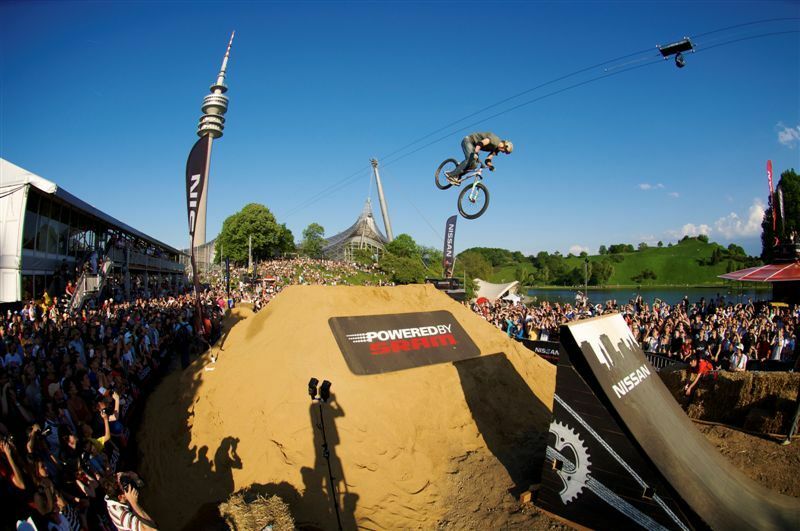 Martin Soederstrom wins a captivating final in Munich’s Olympiapark as the biggest crowd of the year was treated to a nail-biting final on the biggest Qashqai course of the year! It was an amazing event across the board, and the final round at London’s famous Tate Modern Gallery is sure to provide a culminating final to the 2008 Nissan Qashqai Challenge. The wind subsided enough for an absolutely stunning final today at the 1972 Olympic site. 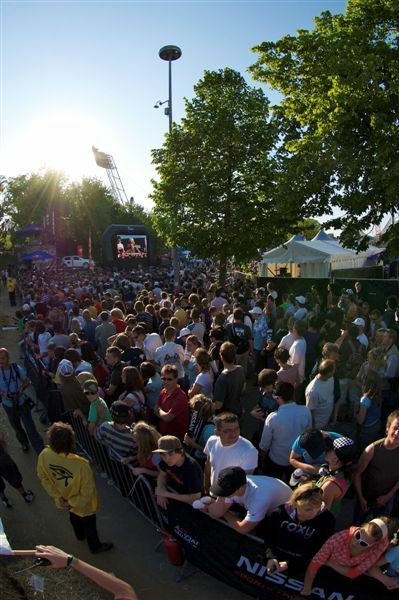 Massive jumps, a live hip hop show and good local DJ crew a huge crowd, and it didn’t hurt that KISS played a sold out show that night in the park. 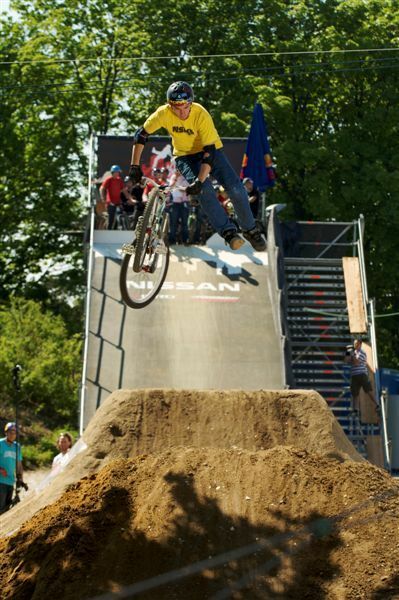 The course was great, two doubles in the upper section fed into a right-hand berm that sent the riders down a grassy slope, popping out of the trees and off a big drop into the lower section where during the whole day in total about 25,000 spectators awaited the two huge final jumps. In the finals, Martin Soederstrom’s unequivocal consistency took the show, he didn’t bobble once on over a dozen 360 tailwhips throughout the weekend. In his final run he pulled a clean truckdriver into a 360 tailwhip to pedals, tabletop off the drop, and was the only rider to tailwhip over the big 9 meter double, capping the run with a clean nose dive 360. Ein schöner 360 von Trond Hansen. Top qualifier Trond Hanson was close with a 360 x-up into a tailwhip, moto whip off the drop, clean 360 over the big double, into an opposite 360 to finish. Brandon Semenuk solidified his third place performance with a tailwhip into a 360 truckdriver, followed by a no-foot can can off the drop, to a seat grab indian air, riding out of a double tailwhip over the last jump. Lance McDermott and Paul Basagotia rounded out the top five and stayed in contention for the overall title. All twelve finalists rode incredibly well, and at one point in the second round the top four riders were separated by only four points. In the end, the riders all agreed with the final results. Martin Soederstroem hat eindeutig überzeugt. 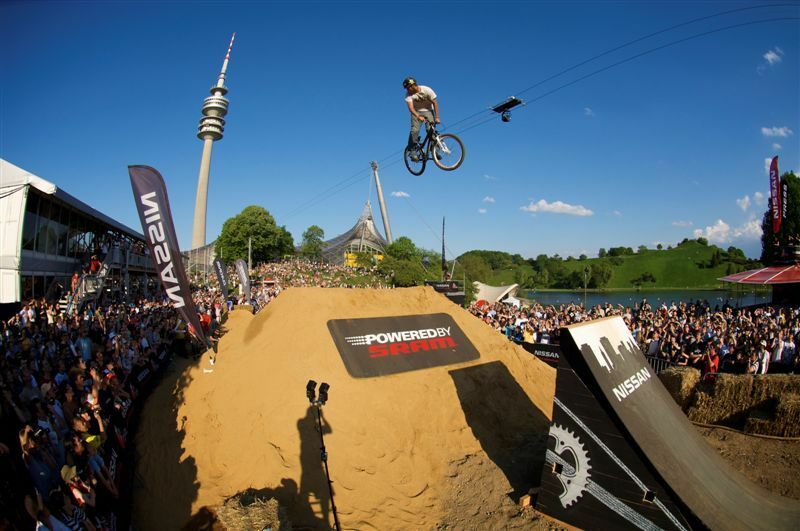 On the podium, when asked if this was the biggest success in his young career, an elated Soderstrom replied, “This is the best day of my life!” The level of riding was extremely high in Munich, and with many riders in contention for the overall title and biggest prize purse of the season, the final round at London’s famous Tate Modern Gallery on Saturday May 24th is sure to provide a culminating final to the 2008 Nissan Qashqai Challenge. Stagediving mal anders: Sam Pilgrim geniesst ein Bad in der Menge. Irgendwie ist dieser Event verdammt öde. also wenn Biken in Zukunft aus drei oder vier Sprüngen mit nervösen Kunstturnübungen bestehen soll… dann mal gute Nacht! 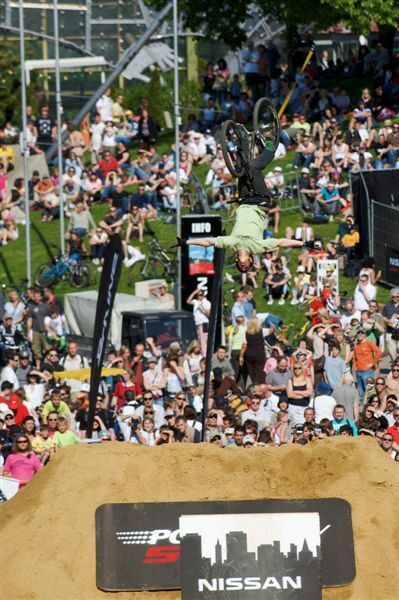 Also wenn ich solches Zeug sehen will zieh ich mir doch lieber ein paar BMX Clips von der Dew Tour rein. Lieber das Original als ne billige Kopie.